A military camp near Siliguri (Sevoke Military Station) in north Bengal celebrating 3rd Gorkha Regiment bicentenary . After all, there are few battalions in the Indian Army that can boast a glorious history spanning 200 years. The celebrations, started on Wednesday, will reach their climax on Friday, April 24, the date in 1815 when Sir Robert Colquhuon raised the 1/3 Gorkha Rifles in Almora. 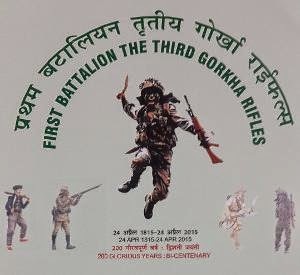 "The 'First Battalion of the Third Gorkha Rifles', known as the 1/3 Gorkha Rifles is the oldest existing infantry battalion of the Third Gorkha Regiment. Only a few others including the Madras and Grenadiers Regiments (1758), Punjab Regiment (1761), Rajputana Rifles (1775), Rajput Regiment (1778), Jat Regiment (1795) and Kumaon Regiment (1813) are the other native infantry regiments that preceded the 1/3 Gorkha Rifles," an officer said. What makes the raising of this battalion more interesting is the fact that this happened towards the end of the Anglo-Nepal War when the British realized that the Gorkhas are feisty, ferocious and fearless warriors. The battalion was first known as 'Kemaoon Local Battalion' and entrusted with policing the border with Nepal. On April 19, 1880, in the Second Afghan War, they would earn their most famous Battle Honour "Ahmed Khel", which is commemorated till date. By 1945, the Battle Honour count was 37, ending with their last "Pegu-1945", spanning operations including the two World Wars. The 1/3 Gorkha Rifles now operates under the Eastern Command and plays an important role along the Line of Actual Control with China in Sikkim. This battalion has been historically associated with Bengal. It's first Indian Commanding Officer, Lt Col (later Lt Gen) P O Dunn took command from Lt Col H V Rose at Fort William, Kolkata, on November 29, 1947. The soldiers of 1/3 GR, adept and skillful in football, gave the top teams in Kolkata some tough competition, winning the hearts of soccer-loving Bengalis. The battalion would then serve in Punjab, Jammu & Kashmir and Nagaland before returning to Kolkata in 1970. By then, it had proved its mettle post-Independence. In 1956, CO Lt Col J R Chitnis bravely led his men in clearing an ambush against his column resulting in 20 dead insurgents. Col Chitnis attained martyrdom in this operation and was awarded the Ashoka Chakra Class - I. "In 1965, the battalion played a pivotal role on the Amritsar-Lahore. In 1971, it became the only battalion in post-Independence India to carry out amphibious operations. While operating in Kargil in 1999, the battalion won laurels. It was selected for an UN Mission in Rwanda between 1994 and 1996. In the aftermath of the Bhuj earthquake of January 2001, the Battalion would play a Samaritan role, providing succor and relief under 'Op Sahayata'. The battalion boasts 200 gallantry and distinguished service awards pre-Independence. After 1947, the tally increased by 117," the officer added. 3rd Gorkha Regiment celebrates bicentenary at Sevoke Military Station, April 24, the date in 1815 when Sir Robert Colquhuon raised the 1/3 Gorkha Rifles in Almora.